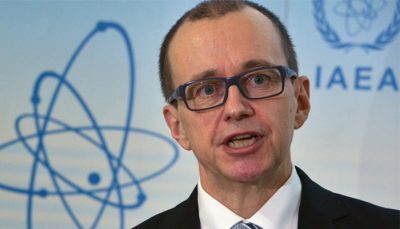 The head of the Department of Safeguards Tero Varjoranta at the Vienna based International Atomic Energy Agency (IAEA) resigned unexpectedly on May 11, 2018, three days after Trump announced that the US was withdrawing from the Iran nuclear deal. One suspects that this resignation is related to the Trump administration’s decision to withdraw from the Iran nuclear weapons agreement which is subject to IAEA verification. Varjoranta, a Finn, had been a deputy director general of the International Atomic Energy Agency (IAEA) and head of its Department of Safeguards, which verifies countries’ compliance with the nuclear Non-Proliferation Treaty, since October 2013. He will be replaced in an acting capacity by the head of the department’s Iran team, the Vienna-based IAEA said (Reuters, May 12, 2018, emphasis added). Was Tero Varjoranta pressured into resigning pending the appointment of a US sponsored replacement? Will the new head of the Department of Safeguards be pressured into upholding the Trump-Netanyhu assertions regarding Iran’s alleged nuclear weapons program. The IAEA director general has appointed Mr Massimo Aparo, acting director, Office for Verification in Iran, as acting deputy director general and head of the Department of Safeguards. When asked what were the reasons for Varjorana’s resignation, the IAEA spokesman responded: “The agency cannot comment on personnel matters, which are confidential. IAEA Director General Yukiya Amano plans to appoint a permanent replacement as soon as possible“(Reuters, May 12, 2018, emphasis added).